Siemens DPC Immulite 1 to 1000 Upgrade for Sale! Video below is of the system you will Receive. No need to purchase ” As is ” anymore. Siemens DPC Immulite 1000 and Immulite 1 Plus! Siemens DPC Immulite 1000 or Immulite 1 Plus (immulite 1 to 1000 upgrade) offers you the most effective way to add valuable additional in-house diagnostic services for with 75 + menu selections available. These services will allow you to provide faster and more accurate results, while at the same time significantly increase your revenue while decreasing your reporting time to the client. 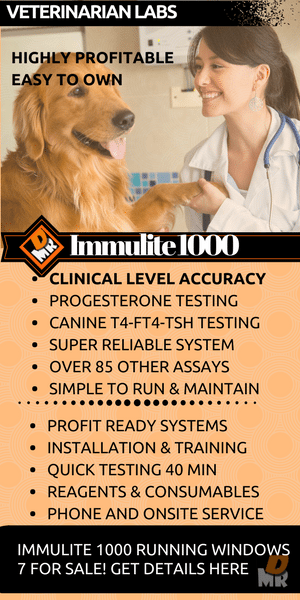 We offer you the Siemens DPC immulite 1000 or Siemens DPC Immulite Plus ( immulite 1 to 1000 upgrade), the most accurate, and one of the best cost per test immunology analyzers in the market today. Now you can have your own immulite in-house! We have taken all the work out of the process and have made it easy and quick to get the highest level results while at the same time significantly increasing your revenue while decreasing your reporting time to the client. This is a one of a kind service, find out more below. Easily Increase your revenue and professional status with the most accurate system on the market! One call is all it takes! We know your heart is with the folks that trust you with the health and well being of their family members that share their lives and homes. You don’t have time to orchestrate everything that would be needed for your lab to procure this level of world class veterinary thyroid testing. We have made it very easy for you! Just one call to 844-673-7378 or fill out the easy form below is all you need do. We offer you package services including everything you will ever need to get your system installed, get you and your staff trained, take care of your test and consumable needs, as well as taking care of service and maintenance on your new money maker! Increase your bottom line while at the same time giving your clients the most accurate, timely, and cost effective testing available. Package Services from a Manufacturer Trained Service Company with over 35 years on the job! Well I am sure you have seen it, if not been in the middle of this kind of bad situation yourself. The “Sales person” sold you a instrument but now you need support and the sales company has no idea how to help you. They just sell you the “box” and move on to the next sale. We see it all the time! Ouch! We are different. We are a service based company! Here at MR Diagnostic Services we have built our business and reputation around the core principle that we sale systems to business people that want and need an ongoing relationship with service, great prices, but most of all accurate results and increased profits. We never just sell the “box” like walmart, shopko, or many of the vendors you see in your practice. What we do is form business relationships with real people that have real needs and wants. We are partners with you so you are never alone. Need a world class instrument? Our engineers trained on the product will provide you with the best system possible to meet your requirements. Need installation and training? Installation including on site training is included with your investment! Need the tests and consumables? We take care of your orders and consult with you on any questions you may have on a test or consumable. Need service? We have been in the medical diagnostic service business for over 35 years so your in very good hands. Need ongoing technical support? We include phone and email support for you and your staff to answer any questions you have. Need financing options? 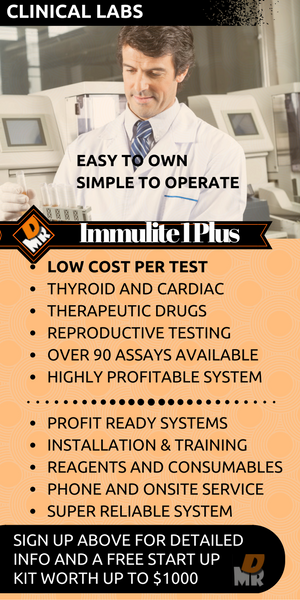 We got you covered with many way for you to finance your immunology Analyzer Immulite plus or the Immulite 1000! We are partners with you and your staff from start to finish! We offer Easy and Quick financing plans to fit your business and personal needs! We know your busy so we make the process easy and quick for you to acquire your Siemens DPC Immulite 1000 or Immulite 1 Plus (Immulite 1 to 1000 upgrade)! We offer out right sale of your re-certified unit including installation, training, tests and consumable needs, on site service and on going phone and/or email support for your questions. Want to keep your working capital for other improvements and upgrades to your practice? Well with that in mind we offer Leasing and Rental options that always include installation, training, tests and consumable needs, on site service and maintenance, and ongoing phone and email support. We will custom design a plan that works for you and your business model! Just give us a call to 844-673-7378 or fill out the easy form below and your MRDS individual investment planner will return your call promptly. We ask the right questions to make sure we understand your special needs, then we work up a plan that is just right for you. Your MRDS Investment Planner will be with you every step of the way so call with the confidence that all your questions will be answered and a program that is just right for you will be built from the ground up. Every proposal is built off the blue prints of your needs and requirements. Once you give us your vision of how the immulite 1 plus or the immulite 1000 can move you to the next level we will then build a plan that will fulfill all your specific needs and wants. MRDS takes care of everything. You only need one phone number 844-673-7378 to get your plan started and one number for any and all follow up. A very simple process with the highest accountable to you and your clients. Bill Salas, Lab Director, T.A.S.C. – Chicago IL. Dr Ekweani – Frisco Urgent Care and Clinic – Frisco TX. Masoud Kamali – President, Vetra-Tech, Inc.